Thank you for contacting the Toronto Master Gardeners with your inquiry concerning your cedars. Cedars of any age can turn brown if they are not irrigated properly. The months of September and October have seen very little rainfall. I suspect that the problem with your trees are that the roots are not receiving sufficient water. 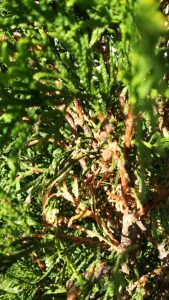 We receive a great number of questions about good maintenance of cedar hedges and to read the questions and answers in our archive, go to http://www.torontomastergardeners.ca/ and in the Find It Here search box type in “emerald cedar” for a list of pertinent questions which you may find useful. ” Cedars naturally grow in wet ground. Regular watering is a must, especially in drought conditions. Water deeply and thoroughly once or twice a week as opposed to watering more often and lightly. When you water, have the water run slowly, a soaker hose works well for a long period of time. If you run the water for at least an hour the water will be able to soak down into the roots. Let the soil dry out before you re-water. You may find you are watering less often but the trees will do better. Small amounts of water will not make it down to the roots. With evaporation, run off and grass etc. competing for the water very little if any will make it to the roots. Were the trees planted too deeply? Take a look at the trunk of the tree. Every tree has a flare near the bottom where the trunk widens right before the roots begin. It is very important that the entire flare of the trunk is above the level of the soil. If it is below the level of the soil it will break down the bark and eventually kill the tree. if the tree is too deep you will need to dig around the tree and raise it up. Another issue you have may be the addition of triple mix with the planting. It is recommended that one uses the soil that was removed from the hole to back fill. The reason for this is with high nutrient soil around the root ball the tree is less likely to send out it roots looking for nutrients and water. It can lead to a smaller, less stable root structure. Hopefully the surrounding soil has enough nutrients to encourage outward growth. Fertilizing the cedars with 30-10-10 three times in the growing season (May, June and July) is appropriate. Don’t fertilize in late summer, as the cedars needs to prepare to go dormant for the winter. When fertilizing first slowly soak the soil around your cedars’ roots with water, before applying the fertilized solution, to make the soil absorbent. Then, prepare a bucket full of 30-10-10 nitrogen-rich solutions exactly as directed, and apply. Lastly, be sure to water thoroughly with an equal amount, after applying the fertilizer, but slowly, and gently, so as not to wash the nutrients away. Another option that does not require mixing, topdressing with sheep manure compost or regular compost will not only feed the cedars but will also improve soil structure, encourage beneficial macro & micro organisms and, the earthworms will love you forever. In late fall you can fertilize with slow release nitrogen and phosphorus, which will lend the cedars a boost come spring. Good Luck with your cedars.